The marinating and the long, slow braising of this dish gives it a richness that is so memorable. 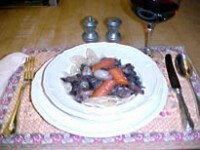 In a large stainless steel bowl, mix the onions, garlic, carrots, wine, parsley, bay leaves, thyme and peppercorns. Add the oxtail pieces. Cover and refrigerate for to 1 to 5 days. 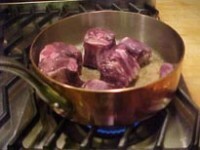 Remove the pan from the refrigerator from time to time to stir the oxtails in their marinade. To cook the stew, remove the pieces of oxtails from the marinade and pat them dry with paper towels. Heat enough butter and oil to lightly coat the bottom of a heavy skillet. When the fat is hot, place the pieces of meat about an inch apart over the bottom of the skillet. Turn the meat with tongs to brown on all sides. Put the browned meat in a cast-iron casserole, strain over the marinade. Add water, if necessary, to barely cover the meat. Bring the liquid to a simmer over medium heat. Carefully skim any impurities or grease that rise to the top. Simmer, keeping the mixture bubbling gently, until the meat is falling off the bone, at least 2 to 2 1/2 hours. Remove the casserole from the heat and let cool. Cover and refrigerate overnight. 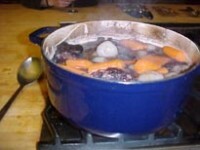 The next day, remove and discard all the fat that has solidified on top of the stew. Add the fresh carrots, salt, and pepper, and bring to a simmer over medium-high heat, stirring occasionally, until the mixture is heated through. 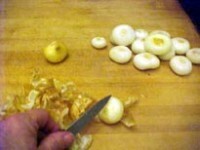 Drop some peeled onions into boiling water and add them to the stew. Taste and adjust the seasoning. 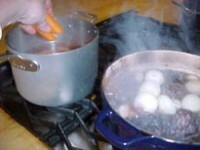 To serve, bring a large pot of water to a boil. Add salt and the pasta. Cook the pasta just until firm. Drain well. Evenly divide the pasta among shallow bowls. 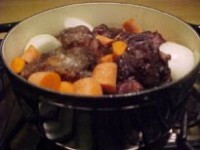 With a fork, carefully remove the pieces of oxtail from the stew. Drain, and place on a carving board. Remove the meat in big chunks, and place them on top of the pasta. Carefully spoon the sauce and the vegetables on top of the meat, sprinkle with just a bit of coarse salt. Serve immediately.